After drawing peg 4 in the last two matches, I was hoping for a change of scenery today (although not 24 either as I’ve been on that one twice as well! 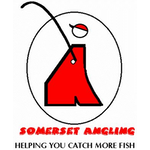 ), I got to the pub fairly early and there was another decent turnout of thirteen anglers. Rob announced the draw and both Ash and me hung back hoping somebody else would pull out 24 but with only three pegs left in the hat, nobody was admitting to it and it looked like peg 1 (another I’m not keen on) was still in there too! I went for it but didn’t look to see which peg I had and then Ash looked gutted as he wrote his name next to 24 on the weigh board, I was sure I’d be on peg 1 but when I opened my hand, the number 22 was staring back at me and peg 1 wasn’t actually drawn as Rob had thought there were fourteen anglers fishing! 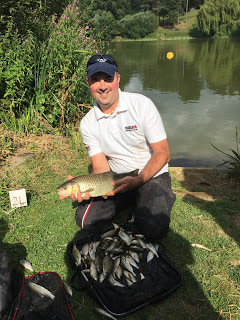 Alvin won off my peg in the first match with 22lb of bream and skimmers but it hasn’t done anything since and as it’s in the narrowest part of the lake, it doesn’t tend to throw up many roach weights. I got out the lake and the level was still well down with the farmer pumping and Ash was going to be in for a noisy day but he managed to borrow some earplugs from Rob but whether they were for drowning out the pumps or my banter, I’m not sure! Rigs were the normal 0.5 gram Drennan Roach for on the deck and a Preston Chianti for fishing up in the water. 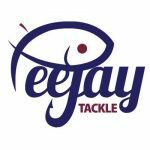 With Ash on 24 and Scotty on peg 20, I was in a Tackleuk sandwich! On the whistle I cupped in two balls of groundbait at 10 metres before starting on the deep rig with caster on the hook, it took a few minutes to get my first bite (which of course I missed!) and I bumped a couple of small fish before a little roach got me off the mark. More small roach followed but it certainly wasn’t fast and furious, Ash was getting a few without really bagging up either. 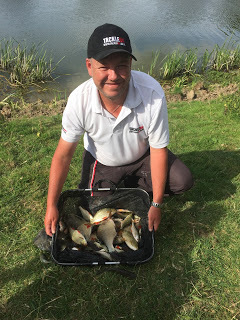 Quite a few anglers around me had started on the feeder, Jake across on peg 2, Scotty on 20 and Rich next door on 19 but as far as I could see, nobody had caught a skimmer yet although Scotty was catching some quality rudd. By the end of the first hour I’d only had 22 fish and no quality apart from one decent roach and I was struggling. 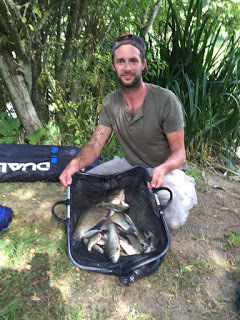 I tried the shallow rig but as per usual I just missed loads of bites and wasn’t putting much in the net, I did have three slightly better chublets but only added another ten fish in the second hour and my catch rate was going nowhere! The feeder anglers had started catching the odd skimmer and then Ash had a 3lb chub and I didn’t know what to do next! 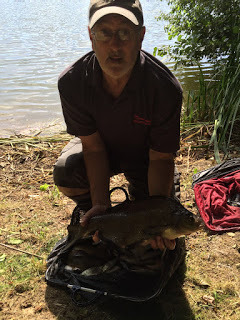 As I wasn’t really catching deep or shallow and with quite a few bonus fish being caught, I felt my best chance of a result today was if I tried to catch a lump or two of my own. I cupped in two more balls of groundbait and started feeding hemp and caster quite heavily over the top. Single caster was a waste of time with small roach taking the bait and I was missing or bumping most of them and double caster wasn’t much better. 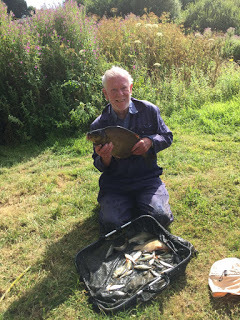 I did eventually hook a better fish but it wasn’t on long and some slime on the hook length indicated a skimmer or eel but after another hour I’d only added a few more small roach and I wasn’t enjoying myself very much. 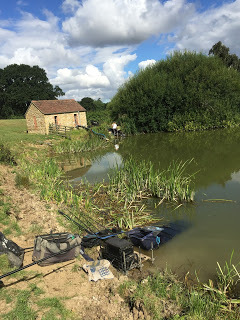 Ash was still getting the odd better roach but he hadn’t added any more chub, Scott was getting the odd skimmer on the feeder and also kept trying his short line where he was getting some nice roach shallow. 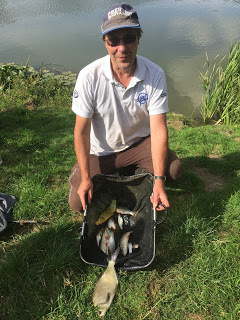 Jake over on peg 2 had a couple of skimmers on the feeder and then caught a nice bream and another skimmer on his short pole line and I’d also seen Fieldy net a decent bream down on peg 10. 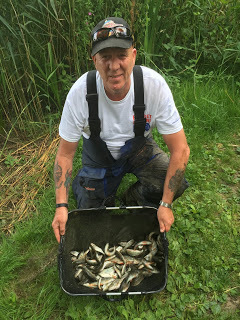 With a couple of hours to go I was still feeding quite heavily and started to catch small roach quite well on the deep rig, with most bites coming on the drop and I ended up with 107 fish which I thought would give me 6-7lb and I was left wishing I’d done it all match as I reckon I could have done around 12lb but I do get bored catching bits and I always end up trying to catch quality fish. Ash took his ear plugs out and asked what I had and I said about 6lb and he said he thought he had around 7lb but as his chub was about 3lb, I knew he had more than that. The scales soon arrived and he was only 100% out with his estimate as he weighed a level 14lb, then it was my turn and I seem to be getting better with my guesstimates as my fish pulled the needle around to 6lb 6oz but then again when you catch bugger all, it’s not hard to keep track of what you’ve caught! Ash weighed 14lb and was only slightly out with his estimate of 7lb! 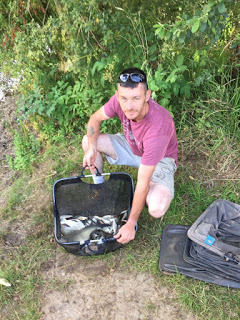 Scott weighed 16lb 4oz which included five skimmers and some lovely rudd that he caught on the feeder along with some pole caught roach. 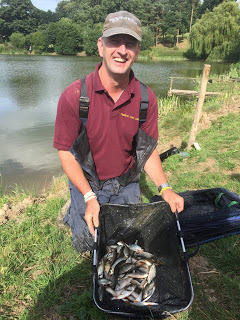 Rich had 3lb 13oz on peg 19 and John Dursley had 5lb 12oz next door but he did lose two good bream, last to weigh in our section was Rob and he’d had a lot of fish for 9lb 8oz from peg 16. Just as we’d finished weighing Rob in, Alvin arrived from the other section and I asked how Fieldy had got on, expecting the answer to be around 15-20lb I was stunned when the reply was that he’d had 447 fish for 31lb, another fantastic weight following on from his 38lb a couple of weeks back. 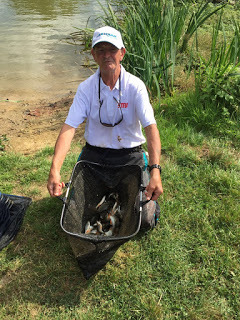 He’d caught a lot of small fish but also had a nice bream, a skimmer and some quality roach. *Thanks to Jake for the photos. 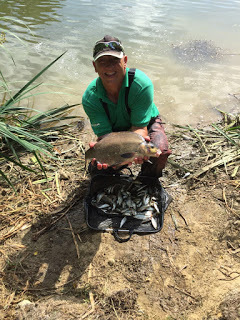 The rest of that section had fished really well too, Jess had 13lb 10oz which included two bream, Alvin had a bream a skimmers for 13lb 5oz, Jake had a bream, skimmers and quality roach for 12lb, Steve ‘The Pole’ Parker had 9lb 12oz and took another nugget off me, Bob had 8lb 4oz which included a nice bream and a skimmer and Nick had 4lb from peg 14. In the league, it’s very tight and after seven matches and dropping the two worst results, Ash and Fieldy lead with seven points followed by Alvin on nine. 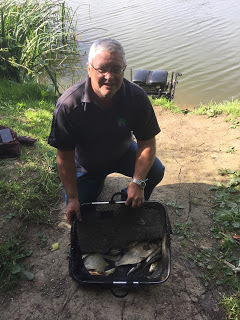 The pond continues to fish really well with lots of bream and skimmers showing on the feeder and the pole (although not for me) and some lovely nets of quality roach are being caught as well (I can’t catch them either!). I’m just not getting it right at all at the moment although, in my defence, some of the pegs I’ve drawn haven’t done me any favours either (that’s my excuse and I’m sticking to it!). Next week we’re at Harrys and I’m really looking forward to it, hopefully it should be a good match with some decent weights and we’ll raise some money for his charity.